Using the technique known as gravitational microlensing, NASA’s Swift and Spitzer space telescopes have separately observed a brown dwarf that may be orbiting its host star in a location where few such objects have been found. Nicknamed OGLE-2015-BLG-1319, the brown dwarf, estimated to be between 30 and 65 Jupiter masses, orbits a K-type star that is about half as massive as the Sun. The OGLE name means it was discovered through the Optical Gravitational Lensing Experiment, a Polish astronomical project that uses microlensing to find exoplanets, galaxies, and dark matter. 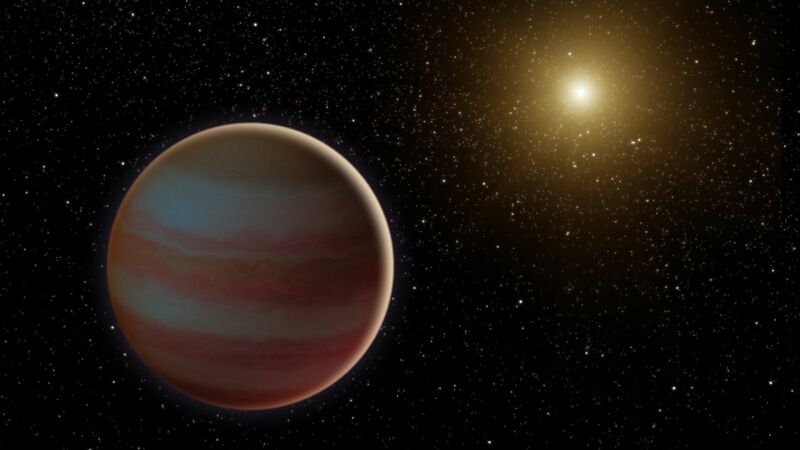 With masses up to 80 times that of Jupiter, brown dwarfs are substellar objects are larger than the biggest planets but smaller and less massive than full-fledged stars. Though they are thought to form the same way stars do, from a collapsing cloud of gas and dust, their cores are not hot or dense enough to sustain hydrogen fusion. This means they are dim and difficult to find. A normal star orbited by a brown dwarf is considered a binary star system, as brown dwarfs are classed in the lowest stellar categories. Curiously, less than one percent of normal stars with approximately the mass of the Sun have brown dwarfs orbiting them within three astronomical units (AU). One AU equals about 93 million miles (150 million kilometers), the average Earth-Sun distance. Some scientists refer to this phenomenon as the “brown dwarf desert”. Yossi Shvartzvald, a NASA post-doctoral fellow at the agency’s Jet Propulsion Laboratory (JPL) in Pasadena, California, suspects brown dwarfs may not be as rare in these orbits as previously thought, just difficult to detect. After OGLE-2015-BLG-1319 was discovered by a ground-based telescope via the microlensing technique, Shvartzvald and his research team decided to observe it with two separate space telescopes in very different locations. NASA’s Swift satellite, in low-Earth orbit, observed the brown dwarf in June 2015, whereas Spitzer, in a much more distant Earth-trailing orbit more than one AU away, viewed it the next month. For Swift, this was the first ever microlensing observation. Microlensing is a technique based on the gravitational lens effect, which occurs when light from a background object is bent by the gravity of a foreground object, producing multiple distorted, brightened images of the most distant object. It has been successfully used to discover low-mass exoplanets. Viewing the system from two different locations enables researchers to benefit from parallax, a phenomenon in which the position of an object appears to change when it is observed from different perspectives. With microlensing, observing the same object from different locations results in varying magnification patterns, ultimately yielding more data on the object. Swift is too close to telescopes on Earth for any parallax to be detected between its observations of the brown dwarf and those of ground-based telescopes. However, “Our simulations suggest that Swift could measure this parallax for nearby, less massive objects, including ‘free-floating planets’, which do not orbit stars,” Shvartzvald said. Based on the data from all three telescopes, Shvartzvald and his research team surmise that OGLE-2015-BLG-1319 orbits its parent star at either 0.25 AU or 45 AU. The former figure would put it in the “brown dwarf desert”. Scientists hope to use microlensing from multiple perspectives to study other brown dwarfs and exoplanets, noted JPL scientist Geoffrey Bryden. Shvartzvald and Bryden are co-authors of a study on their findings published in the Astrophysical Journal.